(P1) Amazon founder Jeff Bezos is the latest tech billionaire to invest his money in spaceships: on Tuesday, he DEBUTED his space travel company Blue Origin’s newest rocket. Now, those who want to cruise the galaxy can choose choose this SLEEK new rocket, or they can opt to ride with Tesla founder Elon Musk on a SpaceX ship, or hop on Richard Branson’s Virgin Galactic. (P2) At this rate, would-be space travelers will be able to choose their favorite tech company, find its richest guy and buy a ticket on his craft of choice. Why does everyone who achieves economic dominance over the planet immediately turn around and try to get off it? (P3) The “boys and their toys” explanation is the obvious one – once you’ve bought all the cars and boats and planes you want, why not buy a rocket? Space is INHERENTLY cool. (P4) Of course, UBER-wealthy tech entrepreneurs aren’t just buying rockets for their personal amusement. They want to get you off-planet, too. Well, not you, exactly, but someone like you with much, much, much more money. (P5) And that’s where the VOGUE for billionaire space travel MAGNATES gets a little weird –and maybe even SINISTER. It’s already very true that money expands your world; the person with the funds to have a car is less RESTRICTED in her movements than the person without one, and the person with a huge plane and the money to fly it is less restricted still. (P6) The expansion of rich people’s travel HORIZONS comes at a price for everyone, both rich and poor. Travel that costs more and feels more INDULGENT is also travel that has a CATACLYSMIC effect on the environment. The faster and further you can afford to travel, the greater your environmental FOOTPRINT. 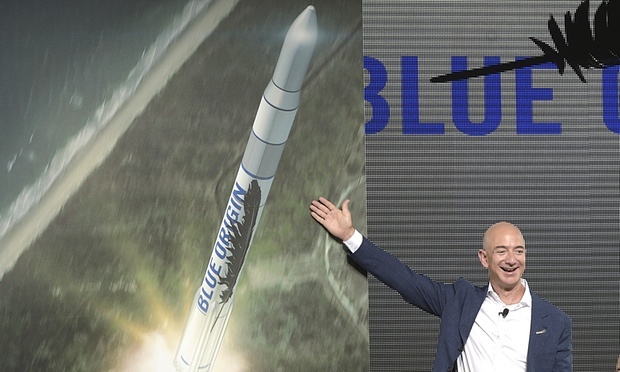 (P7) Companies like Blue Origin are using money and resources to push outwards, to expand the worlds of their rich customers all the way into space. But those same customers – and some of the owners – are making their TERRESTRIAL money in the classic capitalist terrestrial way: by working around any OBSTACLE to profit, including environmental regulations and conservation efforts. Almost all industry is environmentally disastrous, after all; truly PRIORITIZING earth-friendliness would destroy most companies. (P8) Some people with a great deal of money care more about the fate of the world than others, but they’re all willing to CUT CORNERS if it affects the BOTTOM LINE. You can tell because they have a great deal of money; you can also tell because they’re willing to spend it on a ride in a spaceship. (P9) Which raises the question: are they just GEARING UP to WASH THEIR HANDS OF the planet and leave the rest of us to clean up? By pushing outward while ignoring the problems it causes back on the HOME TURF, are they effectively creating a GALACTIC upper class that rests on the backs of the EARTHBOUND? Even if that’s not LITERALLY the plan, it may be the ultimate outcome. Would you be willing to fly into outer space, or would this be too scary? Are rich people able to buy their way out of problems that everyone else is stuck with, as the author of the article suggests? Why is space travel changing from being a government activity to a private business activity? Do you think that there will be a Mars landing or another moon landing within the next ten years?